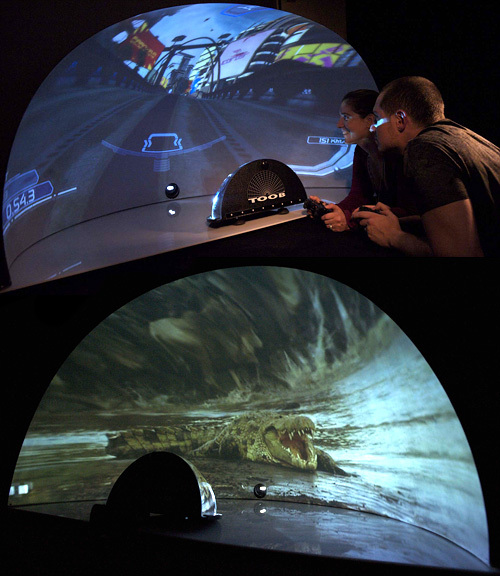 TOOB Immersive Omni-Directional Personal Dome Screens | OhGizmo! Great news! You no longer have to go to an expo/world’s fair/amusement park/science center to experience one of those omni dome theaters. The TOOB provides the same basic experience, though on a considerably smaller scale. Created by Alexander McDonnell, the TOOB consists of a half-dome movie screen that’s large enough for a couple of people to sit in front of, as well as a specially shaped mirror that reflects the image from a projector onto the dome’s surface. And since it’s powered by a regular home theater projector (instead of proprietary hardware) you can use it with any video source like a DVD player or a gaming console. According to Cool Hunting, the home version of the TOOB, which measures 3-feet by 6-feet with an 18-inch reflector, sells for $1,440, but the hardware can be rented and is also available in a considerably larger 8-foot by 16-foot inflatable version for use outdoors. I think this would be great tool for business advertising…especially travel and adventure.